Crew members have posted more photos from the Def Leppard Summer Tour 2014 rehearsals in Los Angeles. 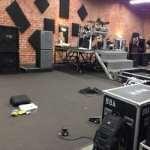 Rosh Roslin who is programming Vivian Campbell's guitar rig has posted more photos this time from the band's new rehearsal space. The band previously rehearsed in Burbank at Mates Studios but have been using this new location (also used by artists like Nine Inch Nails) since the 2012 Rock Of Ages tour. The Summer Tour 2014 kicks off on 23rd June in West Valley City/Salt Lake City, UT in only 9 days time. As mentioned by Phil Collen earlier this week the band are due to rehearse over the next week before the tour starts.